Yes, travel writers like to write. But they also like to walk. Walking is a great way to explore a city at one’s own pace—allowing a visitor to peer in shop windows, people-watch, or gaze at eye-catching doors or rooftops. “Walking is the most intimate introduction to a place,” says writer Kathleen Scott, who blogs at Hill Country Mysteries. I certainly agree with Kathleen. I love seeing cities by trains, cars and hop-on, hop-off buses but nothing beats seeing a city on foot. One of my own favorite walking cities is Barcelona. Like many large cities, this one is comprised of a series of distinct neighborhoods, each with unique character and charm. I fell in love with the oldest district in the city, the Barri Gòtec (Gothic Quarter) because it is so interesting, both historically and architecturally. 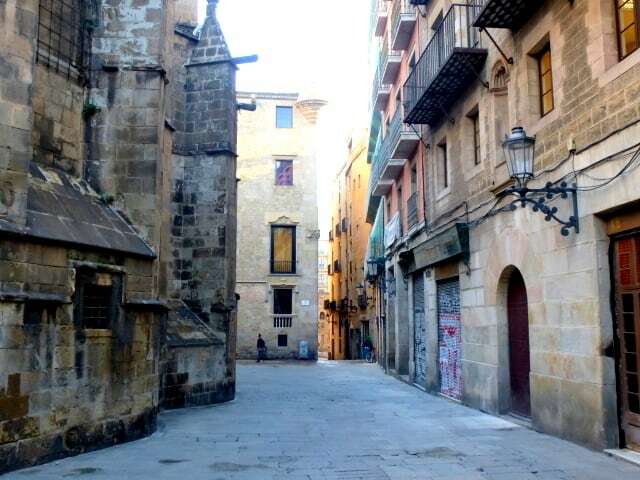 Its winding cobblestone streets, alleys, and squares almost beckon to be explored. I asked my colleagues to name some of their favorites. They also agreed to share some of their favorite photos. I hope you’ll click on the links to their sites and find out more about their travels around the world. I’ve walked through cities and town all over the world, but none more spectacular than the villages of Cinque Terre, Italy. A narrow dirt trail, whittled from cliffs high above the azure Ligurian Sea, leads through five tiny hamlets where the locals still make the world’s finest pesto and fruit cordials from crops grown on ancient terraced vineyards. You can do the trek in one day, but take two and stop midway in Vernazza, my favorite of the villages. Even after a heavy snowstorm hit the city with a record amount of snow, New Yorkers were walking about in Central Park on this February day. When I’m in New York City, I can walk all day long – from one neighborhood to the next, in the parks, and along the famous avenues just taking it all in and feeling happy to be in such a great city. As you’re walking to the theater, restaurants, shops and museums, you never know what surprises you might come across, too. And if you decide that your feet have had enough – you can easily walk to a subway for a ride the rest of the way. One of my favorite cities to walk in just happens to be my home city of Vancouver. Sparkling clean and as safe as any big city can be, the backdrop of the North Shore Mountains framing the sparkling ocean is a gorgeous sight at any time of year. To make it even better, the entire downtown core of Vancouver is ringed with miles of “seawall” for walking, running and bicycling. In the unlikely event that you should tire of the jaw-dropping natural beauty of the seawall, you have only to head “uptown” on Robson Street where just about every luxury brand is represented for the fashionista crowd, and sky-scraping five-star hotels illuminate the night skyline. “Neighbourhoods” such as the tree-lined streets of the cozy, residential West End are wonderful for a stroll; Coal Harbour where this photo is taken is home to some of the most beautiful Vancouver high-rise towers and boasts one of the most beautiful sections of sea-wall which marks the entrance to one end of the amazing Stanley Park. I could easily walk around Vancouver for an entire week and never be bored! If there is one city to walk in, it is Venice. Venice can be overwhelming with its narrow walking paths, bridges, waterways and ornamental buildings, but exploring it is part of the fun. If you are like me, and you like to get lost, then this is the city for you. I tend to wander around, losing myself in the age-old architecture and even after my fifth visit there, I am still amazed that this jewel of a city, audaciously built on this tiny island, even exists. Don’t forget to see this city from the water as well, as I think both ways of seeing this city are spectacular! My favorite walking tour is in Galveston, a historic island town on Texas’ Gulf Coast. In Texas, the past is the stuff of legend. People tell stories about outlaws and pirates, storms and fires, life and death, and sometimes a hereafter in which spirits of the dead remain among the living. Some folks see ghostly happenings as echoes of an unfinished past that lingers in century-old settings. Tour guide Dash Beardsley, a tall blonde man in a long black coat, tells tales of the past and unexplained events of the present during walks in the island’s historical district. The picture above shows The Hutchings, Sealy & Co. Building built in 1895 on Galveston’s Strand Avenue. During the 1900 hurricane, a heroic schoolteacher pulled people to safety through a third-floor window as they floated past and tended the survivors there until she died of a fever. Her ghost has been seen wandering the building. One of my favorite things about my hometown, Philadelphia, Pennsylvania, is its walk-ability. The Center City area is roughly 25 blocks by 15 blocks. In one of the earliest examples of urban planning, in 1683, William Penn, laid out his new city in a neat grid pattern with five green space parks. Having survived London’s Bubonic plague outbreak of 1665 and the Great London Fire the following year, Penn was determined to try to limit the potential for the spread of either in his new city. Penn’s plan still holds in Center City Philadelphia. In Center City Philadelphia, the must sees of the Liberty Bell, Independence Hall and the National Constitution Center are all clustered together at the edge of Society Hill, a neighborhood of colonial brick town homes. Walnut Street, west of Broad Street, is Philly’s version of Rodeo Drive and will bring you to the urban oasis of Rittenhouse Square and surrounding residential streets of graceful 19th century homes. (The photo captures the public art and rose garden in the Square). The city’s world-class museums along the Benjamin Franklin Parkway are walking distance from this area. Basel is a wonderful place to walk with history, art and architecture–its Old Town is intact, compact and pedestrian-friendly. The Cathedral Hill has been occupied for 22 centuries and you can still see remains of Celtic and Roman settlements near the Münster (cathedral). The Renaissance Rathaus (town hall) is impressive, and there are perfectly medieval preserved towers and walls. You can people-watch at outdoor cafes or from a bench along the Rhine promenade, and admire public art, fountains and gardens. Tired of walking? Take a tram or a rope-pulled ferry across the Rhine. Basel is home to more than 40 museums, including the world-class Kunstmuseum and Beyeler Foundation. Themed walking tours offered by Basel Tourism begin and end at the Marktplatz and lead you through the streets of the Old Town to the most important museums and through the prettiest squares. What are some of your favorite walking cities? Hey! Thanks for the mention and what a wonderful collection of cities to explore! I am especially interested in exploring Basel, Switzerland, so it has moved up a few notches on my bucket list! Tip of the iceberg, Cacinda! It would be great to show you around Basel, so let me know if you are headed this way. Thanks so much for including my walking city, Irene. And after reading the others, looks like I have a few walking destinations to add to my list! I was pretty inspired by this list myself! The achingly picturesequ Cinque Terre indeed provide wonderful walking trails, both along the coast and up into the vineyards. I would, however, take issue with calling five villages a “city.” The largest has a population of roughly 800. the smallest something like 300. Also, the trail between Vernazza and Corniglia, washed out in a devastating storm in October 2011, still had not been repaired as of early October 2013. Thanks for including Philly. Time to lace up my sneakers and get outside for a walk—winter coat today too! Irene, thank you for this post, and for including lovely Basel, my home city on the Rhine. I enjoy knowing about places that inspire other writers–and walking a city is the number one way to soak up the atmosphere-that-inspires! Looks like I’ve got some walking to do in a few places I haven’t yet been. I can’t wait to get to Venice — I can easily picture myself wandering around there for a few days. Totally agree with your choice of Barcelona, Irene. What a wonderful walking city. Thanks for including me in your post! Great list! Rome is my favorite city to walk. There are wonderful surprises at every turn of a corner. I visited Barcelona this summer and think the best way to explore it is on foot. The city is pedestrian-friendly. A bus or tram passes by too quickly to take in everything. And the side streets are worth investigating. I also visit Vancouver frequently and like walking there. I especially enjoy the walk along the seawall or the beach in Kitsilano. I will have to explore walking in the other cities on the list. Fabulous list. I love, love, love to walk in cities. I prefer it to any kind of transportation. In fact, I always wear a pedometer and at the end of the day, my husband and I try to guess how many miles we walked. The loser has to buy the drinks. Love that idea, Sheryl! I’m going to search for my pedometer! Irene, a friend introduced me to an android phone app called Map My Walk that uses GPS to track your walk distance and route. There’s an I phone version too. When I walked on the beach at low tide, it showed me walking offshore in the ocean. If you are as compulsive as I can be, it relieves you of wondering if your stride is accurate for your pedometer reading. On the other hand, it probably uses a lot of data and battery, so it might not be all that practical for international travel. I like Sheryl’s little walking game. We’ll have to try that. These are some great walking cities. I never would have picked Galveston though I’m not sure why since I’ve never been. Walking is just about the best way to get to learn about a place. There’s something centering about having my feet touch the ground that even though everyone thinks I’m directionally challenged, I don’t get lost when I’m walking. A little plug, both Margie Goldsmith and I were contributors to National Geographic’s Walking New York in its Cities of a Lifetime series. I did Lower Manhattan and Margie did Central Park. And yes, it is probably my favorite city for walking, although Boston would have to be up there as well (particularly Harvard/Cambridge and Brookline). Last time I was in NYC, I walked for hours and hours. The weather was too beautiful to go underground on a train or to board a bus. Plug well deserved, Judy! Is there a link you can share for people wanting to take NYC walks? For those who like Basel, Bamberg, Germany is also a walker’s treat. Lovely old city, largely unspoiled, and great beer too. What’s not to like? Lyon is also a great city for walking (and biking). Everything central is very close, you’ve got architecture from the Roman times to contemporary, rivers (2), hills and more to explore..
Each part of Europe has many ‘hidden’ jewels for walkers. Yes, even the often overseen North Europe. For example, in Norway you can walk around the fjords in the morning in a situation where you can walk from above the mist to through and under the mist and back up again. When the sun starts to ‘melt’ the mist away, the beauty of nature appears. That within the limits of the municipality if you pick right. Finland has a lot of nice city walks with a lot of nature such as lakes, riversides, seasides and small forests and parks… and so on. Europe in general is very walkable and versatile so there’s pretty much something for everyone. I stopped briefly in Lyon on a river cruise and hope to return. It seems like such a wonderful city! Nice list, probably we could add a few more. I found Krakow, Poland quite walking friendly. Portions of Paris, Venice, Amsterdam are also nice to explore on foot. Beautiful Cinque Terre provides wonderful walking trails, and so does Luxemburg. It also has some nice trekking trails. In India, I found Pushkar town in Rajasthan and Fort area in Mumbai quite walkable. Thanks for adding these to the list.